Fresh off his Main Stage presentation at RGD’s Design Thinkers conference, notable designer Stefan Bucher stopped by our booth in the exhibit hall and left as the enthusiastic new owner of both 344.design and DailyMonster.ink. 344.design is now home to the company website for Stefan’s studio, 344 Design, through which he has created designs and illustrations for clients David Hockney, Judd Apatow, and NASA’s Jet Propulsion Laboratory, not to mention album covers for the likes of Sting and Whitney Houston. So why on Earth would this accomplished designer want a .ink website? And what is Daily Monster? Much like the monsters themselves, over its life of 10+ years, Daily Monster has expanded and evolved. The website and it’s videos have spawned a book containing stories about each monster sourced from his fans all over the world, and even an app, the DAILY MONSTER Monster Maker! 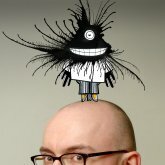 In its latest evolution, Stefan re-launched DailyMonster.com as DailyMonster.ink. More about Stefan’s work here, including the six books he’s authored (so it should come as no surprise, he’s won a D&AD award for book design, too). Previous Article What are premium domains? Next Article Major price increases on selected domains?